Part of the reason the watch market has seen the incredible rise of “micro brands” has been because of consumers’ search for unique products. This phenomenon has taken over many industries and created a situation where consumers are willing to pay a little extra to get a unique product that hasn’t been mass-produced like most of its competitors. For consumers with this mindset, it’s a great time to be alive! Technological developments has opened the door to many businesses, allowing them to crack into a market that otherwise would be impossible to enter. Similarly, tools like Kickstarter have alleviated heavy investment and economic pressures that have dissuaded people from entering highly competitive markets. Like I said, it’s a good time to be alive as a consumer of these goods. Like many micro brands, Stratis brings a unique design and approach to their products. However, they are able to take the individualistic factor a step further, like few brands I have ever seen. 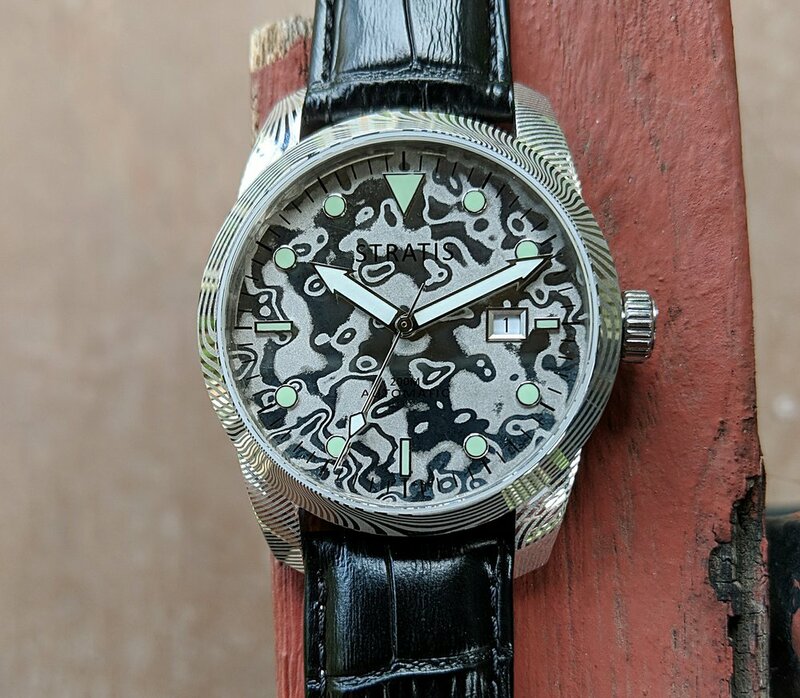 Stratis has created truly one-of-a-kind watches, using Damascus steel. This truly unique material is made of forged steel, creating product that each differ from one another. By using this ancient art form, no two Stratis watches are the same. How’s that for unique? As awesome as individualism and one-of-a-kind designs are, I want a tried and true movement beating inside of my watch. We’ve discussed in-house movements here, but for something like this, a workhorse movement is tough to beat: It is solid, easy to service, and it won’t fail you. When thinking of a workhorse movement, there’s no better one than the ETA 2824. These Swiss made watches are essentially the gold standard of movements, beating at 28,000 vibrations per hour. Depending on the model of Stratis you buy, you are given an option between a gold or silver ETA movement, both visible through the exhibition back. These watches come in a couple of variants, each unique from one another. Here are the full specifications. On the wrist, this is certainly a hefty watch. It has great presence that won’t disappear. However, it is not overly large like many watches seen today. The watch shines with the beautiful Damascus steel patterns thrhoughout the case and dial. It is difficult to not be distracted by this beautiful design. · We’ve talked about the inherent uniqueness of Damascus steel. However, something not mentioned is how this metal is used not just on the dial and case, but even on the buckle. Very cool. · Applied indices are always appreciated, and they help the markers pop and not get lost within the busy and complex dial. · ETA movements are becoming scarce. It’s always great to see one in a watch I’m looking to buy. · AR coating is also a nice touch that many brands often overlook and think it will go unnoticed. · The screw-down crown found in this watch offers more protection. · I sound like a broken record with every watch review, but I think this one would be perfect had it been a few millimeters smaller. While 44mm is not a deal breaker, it’s certainly on the large side. This isn’t much of a downside to it; it’s a matter of personal taste. I was drawn to this brand because of one thing: Individualism. Each watch is truly unique from each other, and in a world of mass-produced products, there’s a certain beauty to that. Stratis is just launching their Kickstarter campaign. Whether you’re a micro brand fan or not, these guys are definitely worth your time. Check them out!